A bunch of small air leaks add up. Not air-sealing your home is like leaving a window or door wide open. You wouldn’t leave a window open on a cold night during winter with the furnace going full tilt – or on a warm day in summer while running the AC. But that’s exactly what you’re doing if you haven’t air sealed your home! Burke Construction provides air sealing and testing services all throughout the state. As one part our Home Energy Audit, we will help you determine the best ways to save energy by sealing air leaks that exist in your ducts, around windows and doors, in walls and attic floors, and elsewhere in the home. Doing so will save lost energy and dollars year round. Moreover, your home will now be more comfortable. With our air sealing service, rooms that overheat in the summer because of hot air infiltration will become cool, and rooms that are cool and drafty in the winter because of cold air infiltration will become warm. What many homeowners do not realize is that it's not uncommon for a home to have the equivalent of an open window's worth of air leakage, even when every window is shut tightly! Recessed light fixtures are one of many common air leaks that we can seal safely and efficiently. Heat can find its way out of the home through a wide variety of gaps, cracks, and holes in all parts of the house. With our blower door test and home energy audit, we can quantify how much air is leaking out of your house and pinpoint the leaks. From the attic to the basement, Burke Construction can locate and seal air leaks all throughout the home. If you're interested in having us diagnose your home with our comprehensive Home Energy Audit and seal air leaks to improve home comfort, call or e-mail us today! 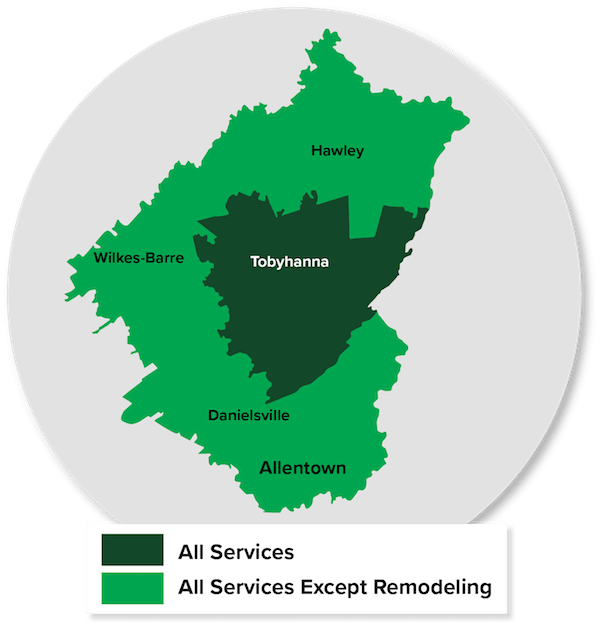 We proudly offer our services all throughout PA, including: Stroudsburg, Easton, Allentown, East Stroudsburg, Bethlehem, Bangor, Pen Argyl, Bartonsville, Wind Gap, Pocono Pines, Mount Pocono, Mount Bethel, Catasaqua, Long Pond, Tobyhanna, Gouldsboro, Brodheadsville and more! When good air leaks out, bad air leaks in! Understanding the "Stack Effect" - The laws of convection cause warm air in your house to rise. As it rises, it moves up through the attic, passing through dozens of cracks and exposed openings. As this air is lost, new air is pulled in from the crawl space, basement, and outside, only to be heated again and lost again. This cycle of air ex-filtrating from the top and infiltrating from the bottom is known as the "stack effect". Small Air Leaks Mean Big Money! - When houses leak air, you're left continuously paying to heat, cool, and dehumidify air from the outside. Air leaks are an enormous waste of energy, and they make it much more costly to keep your house comfortable. Dirt stains on fiberglass insulation are a clear sign of air leakage. It shows that the insulation is merely serving as a filter, trapping dirt and dust the same way a furnace filter would. If you see dirt-stained insulation, you can be sure that your house is leaking air! Joints = Air Leaks. How do air leaks form in a home? To begin with, your house is made from thousands of pieces and parts, including nails, wooden boards, framing, electrical wire, wall panels, pipes, and so on. Small gaps often exist where one part of your house connects to another. While a joint may be airtight when first installed, that may not always be the case. Wood can shrink, materials can expand and contract at different rates, and connections can come loose. Leakage points can form all over -- ones that should be sealed to save you money. Larry Janesky, President of Dr. Energy Saver, talks about the importance of air sealing and insulating your home for increased energy efficiency -- regardless of whether you live in a warm or cool climate. For more videos on air sealing, see Dr. Energy Saver's On-the-Job Video series. Air leaks are built into the construction process as your house is being assembled. As soon as the framing crew finishes their work of nailing together your studs, joists, rafters, sheathing, and beams to create the house shell, another team of workers march in and begin to cut it apart. Electricians, HVAC contractors, and plumbers will drill and saw their way through floors, walls and ceilings, creating channels for the wires, heating ducts, water lines, and waste pipes that need to be run throughout the house. The holes that are created don't compromise your home's strength, but they do result in a network of leakage points that can let air move in and out. Air leaks at receptacles. Air leaks through plumbing chases. Air leaks through ill-fitting soffits. Gaps in your home can be small, such as the ones found around an electrical outlet in an exterior wall. However, large openings are also common, such as the ones created by plumbers in floors and framing as they install pipes, or the long gaps like the one created when a cantilever soffit does not meet the exterior wall in an airtight connection. Don't Insulate Before Air Sealing! There are many air leaks in your house where heat can leak out of the conditioned space and into the attic. If you insulate without air sealing the surface first, the air will just leak right through the insulation! Many types of insulation do not stop air flow! To make matters worse, now all the air leaks are buried underneath all the insulation, making them harder to reach. Air sealing should always be done before insulation is installed! Burke Construction provides both air sealing and insulation services. And many, many other places! Sealing air leakage saves money! Professionally air sealing your home can reduce heating and cooling utility bills by 20% or more! The good news: Home air sealing is a "once-and-done" lifetime repair. There's nothing to maintain or replace once the process is complete. All that's left to do is just enjoy the savings and comfort for as long as you own your home! Sealing air leaks that appear within the building envelope of a home is a process called "Air Sealing." When applied to the property, it increases the comfort and energy efficiency of the home, while decreasing fuel bills. However, finding and sealing air leaks is much easier said than done. Locating these air leaks requires special equipment, training, and access to parts of the house a homeowner would generally not be able to (or want to) reach. Once the sources have been located, it's also important to select the best products and practices to properly air seal these areas. No more leaks! - For many air sealing tasks, Burke Construction recommends two-part foam. The mixture leaves the nozzle in liquid form but expands rapidly to fill and adhere inside cracks and gaps. As it cures, the foam will create a barrier that is both airtight and functional as insulation. Most homeowners are excited to see how much energy they'll be saving after they've had their home air sealed. With Burke Construction, you won't need to wait to see the difference in energy efficiency in your home. Burke Construction technicians can perform a second blower door test when the air sealing work is done. The lower leakage rating confirms that you have a more airtight home, with enhanced energy performance, greater comfort, and lasting savings on your heating and cooling bills. Start saving energy and money with an air- sealing upgrade. Don't let anymore of your conditioned air escape from your home! Call 1-855-218-2261 or contact us online to schedule a free inspection of home insulation and an air sealing cost estimate. We also offer a comprehensive home energy audit. We are your trusted air sealing contractor serving Easton, Allentown, Stroudsburg, Bethlehem, East Stroudsburg, Pen Argyl, Bangor, Wind Gap, Pocono Pines, Bartonsville, Mount Bethel, Mount Pocono, Long Pond, Catasaqua, Gouldsboro, Brodheadsville, Tobyhanna and the surrounding areas!